My husband installed D-Link cameras so we could keep an eye on her and what she is up to – we had 2 in our kitchen and 1 in the hallway, and it was on one of these D-Link cameras that we caught Poppy counter surfing. It is incredible how her thought process took over when she heard me coming down the stairs – I’d seen her jump on the counter on the camera while I was upstairs in my office and she made it look as if she was in her own room all the time with the way she walked out of it! She is one very smart cookie! These cameras have given me great piece of mind when my husband and I have had to go out and leave Poppy at home. We are very lucky as we both work from home, but whenever we go out we can look on the cameras via an app and check what Poppy is doing and what she is up to. According to statistics, as many as one in four dogs reportedly suffer from depression, caused by the stress of being left alone by busy owners. This issue can be exacerbated for animals whose owners work longer hours or have just returned to their jobs. 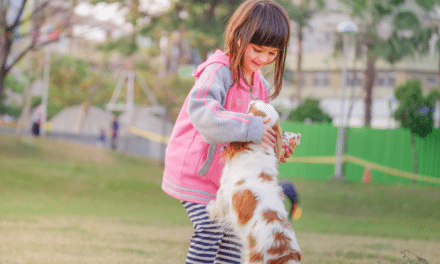 It’s not just affecting pets either, with the growing demands modern living often brings, spending more time away from their pets makes owners feel guilty. I know that I feel incredibly guilty whenever I go out and leave Poppy even for just a few minutes! I often thought how great it would be to be able to speak to Poppy and she could hear me through the D-Link camera app, dispense treats for her if she was a good girl and for her to keep her occupied while I’m not there. This is where Pawbo comes in! I first discovered Pawbo by accident via my Twitter feed a few weeks as their PR company was asking for journalists and bloggers to contact them and attend their launch event at Battersea Dogs Home recently. It looked interesting so I popped onto the Pawbo website to see what it was, and I was hooked! 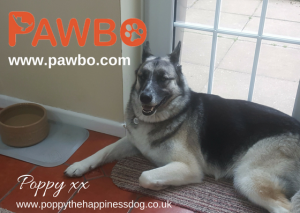 Quite simply, Pawbo is a range of interactive products that allow pet owners to connect with and keep an eye on their pets while they are out, thus eliminating stress and boredom creeping in and dogs potentially chewing and destroying things while their owners are out. While my husband and I are two of the lucky ones as we are at home with Poppy pretty much 24/7 (and if one of us is out the other is usually in), modern life dictates that pets and their owners are often forced to be apart, sometimes for many hours in the day. Although standard advice is that dogs should only be left for up to 4-5 hours at a time at the most, many dogs whose owners go out to work are often left for much longer, sometimes up to 8 hours or more. Pawbo is designed to give peace of mind to owners and help them to engage with their pets when they are out. 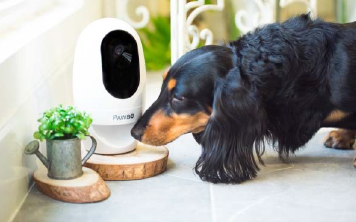 The Pawbo+ offers the latest in innovative technology and is a special interactive camera that is controlled via the free PAWBO Life app which is compatible with iOS and Android platforms. Via the PAWBO Life app, furbaby parents like me can not only hear and see our furababies, but we can also interact with them. This is particularly good if your pet suffers from separation or has anxiety issues brought on from being left home alone for long periods of time. The key features of the Pawbo+ include a treat dispensing camera designed for small cats and dogs, which enables owners to reward their pets for good behaviour straight away, a 720P HD live video an 130 degree Wide-Angle Lens which is supported by high-quality sound, six built-in ringtones to attract your pet’s attention, built-in games for interacting with your pet, a push-to-talk function that allows your pet to hear your voice at the touch of a button, a laser pointing game that owners can control manually or set to play automatically and video storage of up to 15 minutes via Dropbox. This is a combo pack which includes a Pawbo+ along with their latest add-on accessory to the Pawbo+, the PAWBO Catch. The PAWBO Catch provides more interaction between pets and their owners remotely as its random programme stimulates and exercises your pets minds, all at the click of a button! 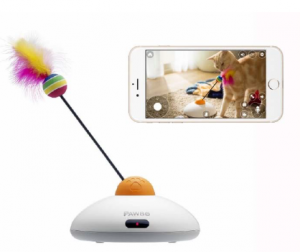 The key features of the Pawbo+ Combo include a remotely controlled interactive cat teaser to create more fun with your cats, control multiple Pawbo+ devices and operate multiple Pawbo+ accessories via the PAWBO Life app, instantly upload images of your pets to social media platforms via the PAWBO life app, speak with and hear your pets anytime via the two-way talk function anytime and anywhere, and entertain pets manually or automatically with a pre-installed light chasing game. To complement the Pawbo+, these delicious cat treats and special nibbles can be dispensed anytime as a treat or a reward in between meals, as and when feline owners choose. Formulated with Europe’s leading pet nutritionalists, they are available in 2 mouthwatering flavours – Chicken, Duck and Turkey or Salmon and Trout. They are even made with for cats with dietary requirements in mind and are made with hypoallergenic ingredients, which means no added train, wheat or wheat gluten – and no added sugar! PAWBO Flash – Lights, Camera, Action! 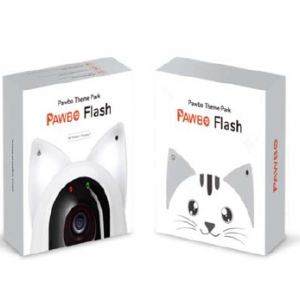 The newly launched Pawbo Flash enables pet owners to gain “night vision” so they can keep a watchful eye on sleeping pets even in the darkest hours of the night. From dinner with friends, to simply lying in a bed that has enforced a “no pets” rule, night time is often a prolonged period of absence from our four-legged friends but Pawbo Flash helps pet owners to see their pets in the dark, without having to leave the light on. 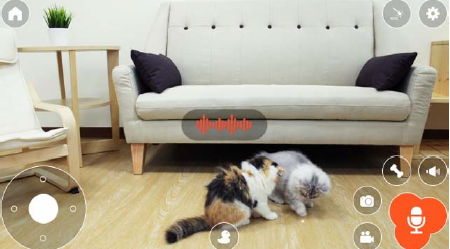 Designed as a super cute pair of ears that is fully compatible with the Pawbo+ interactive pet camera, they come with a built-in light which shines gentle, soft light into the room, making it easier to capture the sight of pets even in the darkest of rooms. The clever design of the Pawbo Flash doesn’t stop there though! Each one features a light sensor which means that the light automatically turns on or off dependent on the ambient light in the room. It features a “breathing light” design, which is a comforting light that fades in and out to avoid spooking pets. 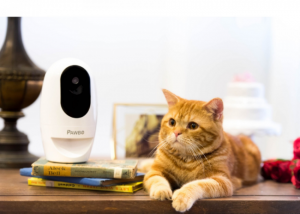 The built-in sensor also detects the location of pets and will dim once it is in close proximity of the Pawbo+ to avoid damaging pet’s eyes with over exposure. Responsible Pet Ownership Has Never Been Easier With Pawbo! From the first day I brought Poppy home as a rescue from Danemere Animal Rescue Centre, I wanted peace of mind that I could always see her even when I was out. The D-Link cameras my husband installed have served their purpose, but I can’t wait to try out Pawbo+ properly and move on to the next level of interactive pet care. I believe that the launch of Pawbo will revolutionise the UK pet care industry and may even help to counteract huge pet care costs while still keeping the best interests of pets at heart. 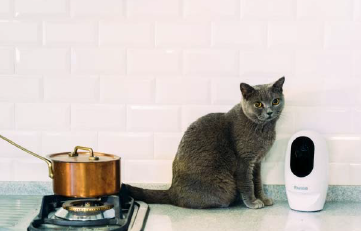 The Pawbo+ may offer a complementary solution to pet care when pets are left at home for a temporary period, alongside pet sitting arrangements that also incorporate regular meals and exercise for your pets. For more information about Pawbo’s product range, visit www.pawbo.com. Prices start from £149.00 for the Pawbo+.